Based on the battery type, use an better charger in a well ventilated place that is able to deliver a continuous, temperature compensated "float" charge at the battery before it being fully charged. If over-charged(12V cell charging volt higher than 13.6V), the cell`s electrolyte will loss H2O very fast which raise gravity of acid resulting in sulfation heavier and plates corrosion. Don`t keep the battery in a wrong charging current value, use the right charger at the battery manufacturer's recommended float or maintenance voltage for a fully charged battery. The best charging current value is 0.1C(e.g. 1 cell capacity is 100Ah, C=100A, the charging Current value =0.1C, 10A), the Max Recommended Value is less than 0.3C. If cell charged at high charging rate, the cell voltage will reach a high value, resulting in over charge and H2O separation. Thus, well charge management could slow down sulfation. Our 72V eTricycle Smart Charger will be your best partner which can help you eTricycle Power Battery Maintenance to prevent sulphating and H2O separating, no overcharged , temperature compensated. 72V eTBC150L is eTricycle Intelligent Maintaining Charger, is more than a battery charger and battery saver. During the charging cycle every day, our patented desulphation pulsing constantly works to minimize and reduce naturally occurring battery sulfation as a kind of eTricycle Power Battery Maintenance real-time mode. By this way of charging, your EV power battery will be charged deeper, maintained greater reserve capacity extend battery life doubled or more. 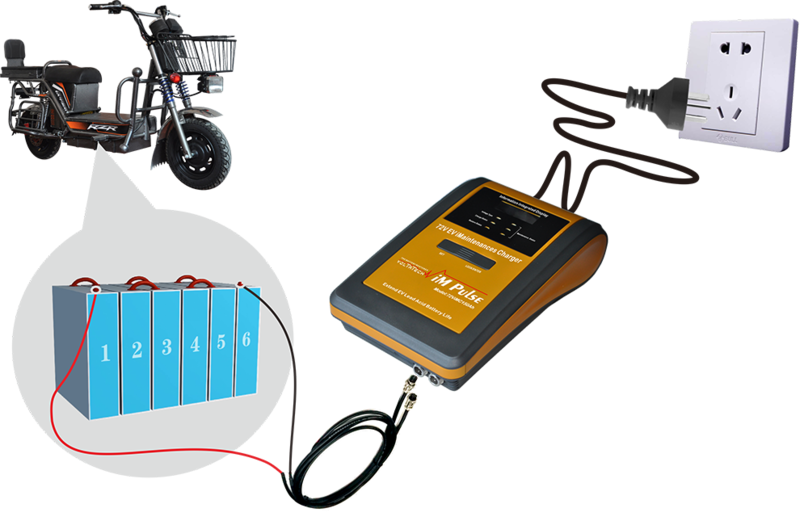 As you will read, this 72V eTBC150L eTricycle iM Battery Charger for electric bicycle or tricycle is a multi-functional charging maintenance system developed by us based on our multi-year research results used for power battery of electric vehicles. It is applicable to digital pulse charging, non-destructive repair and pulse maintenance desulfation of all types of lead batteries in 72V/10Ah~150Ah. As well as called it Battery Desulfation Smart Charger or EV Smart Battery Saver. Looking for ideal ETricycle Intelligent Maintaining Charger Manufacturer & supplier ? We have a wide selection at great prices to help you get creative. All the ETricycle IM Battery Charger are quality guaranteed. We are China Origin Factory of ETricycle Power Battery Maintenance. If you have any question, please feel free to contact us.